This vibrant city our campus calls home provides the ideal venue for educational aspirations. IUPUI belongs to this city and to the state of Indiana. Our campus adds to the power of this remarkable place, so rich in history, culture, industry, government, health care, and political opportunities. The fluid boundaries of our campus translate into a diverse, welcoming, and engaged community. Our faculty, staff, and students work with neighborhood residents through initiatives like the IU McKinney School of Law’s Pro Bono Program and the Student Outreach Health Clinic, which offers not only medical and nursing care but also dental, social work, legal, and other services. In this same spirit, students in the IU Kelley School of Business launched Kelley Indianapolis Cares, whose members volunteered 400 hours in the community in the organization’s first year. Alumni remain right here in Indiana to teach, create, operate businesses, serve as health care professionals, conduct scientific research, and provide incomparable civic leadership, among other ways that they give back to their communities. 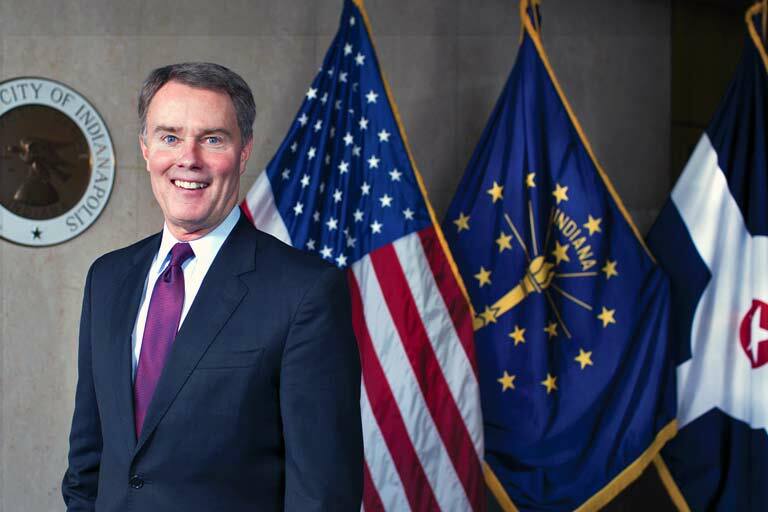 Indianapolis Mayor Joe Hogsett, a 2007 graduate of IUPUI, shared his thoughts about the powerful partnership between IUPUI and the city. Education at its fundamental best is about evolving your mind to an ever-changing world. The city of Indianapolis resonates throughout the hallways, classrooms, and facilities on campus, informing our sense of community. It is more than an address. It’s part of our DNA. IUPUI’s massive scope and scale as a research and educational enterprise make us unmatched in our power to effect positive change. With more than 7,000 full-time employees and a payroll of $622 million annually, IUPUI is one of the largest employers in Indianapolis. The university is one of the city’s biggest consumers, spending upwards of $253 million a year on goods and services, 66 percent of which is spent within the state. Community-engaged research and teaching allow us to contribute our economic, human, intellectual, and institutional resources to improve our world. Our new IU School of Nursing Champion Center for Cancer Control Research is an example of these efforts. Here, faculty, staff, and students are pursuing groundbreaking research in cancer control that will benefit patients for generations. The Indianapolis community is an important part of the IUPUI Regatta tradition. It fully represents our commitment to engage with the people of our city. A dedication to service learning drives IUPUI students and faculty. Through nationally recognized service-learning programs, IUPUI has engaged hundreds of faculty members and thousands of students who have given countless hours to the community. Our faculty serve as national advisors on matters related to disaster relief, diversity in higher education, public health, and other areas. In fact, the dean of the Fairbanks School of Public Health at IUPUI was recently named to the Secretary of the U.S. Department of Health and Human Services’ Advisory Committee on National Health Promotion and Disease Prevention Objectives for 2030. This concentration of expertise in a wide range of areas positions IUPUI as a valuable partner on the local and national levels, especially in areas requiring research and data-driven decisions.